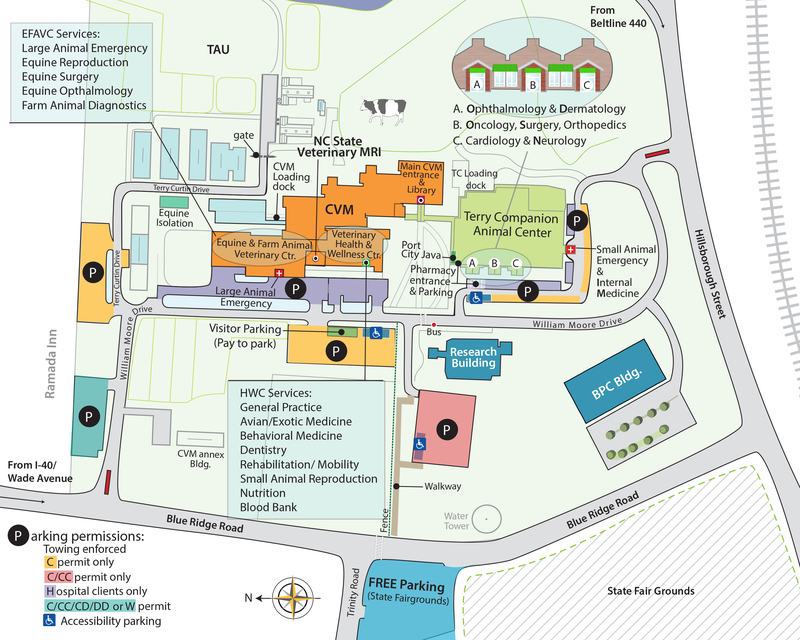 The Cardiology Service is located in the Terry Center at the NC State Veterinary Hospital. We offer a wide range of diagnostic and therapeutic services to clients whose animals are suspected of having heart disease. Our Cardiology Service cares for veterinary patients from the earliest detection and diagnosis of heart disease (including screening apparently healthy pets for the presence of heart disease) through the advanced stages of heart failure. What Makes NC State Cardiology Special? We are also a leader in heartworm research. The Cardiology Clinical Studies page lists our current clinical studies, including the study’s purpose, benefits for participating, and financial incentive information. The NC State Cardiology Service offers a Holter (24-hour ambulatory ECG) program to assess your dog’s heart rhythm and rate. 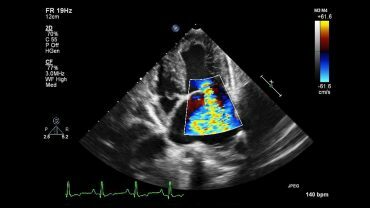 NC State’s Cardiology Service is a leader in echocardiography and advanced imaging techniques to evaluate structural heart disease. Although the term heart failure may sound like the heart suddenly stopped beating, heart failure usually develops slowly – often even over years, as the heart gradually loses its pumping ability and works less efficiently. 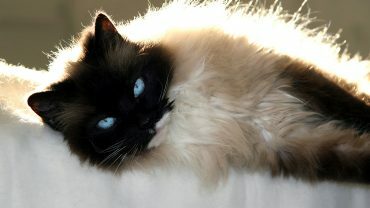 Hypertrophic Cardiomyopathy (HCM) is the most prevalent feline cardiac disease. This genetic disease can lead to atrial enlargement, congestive heart failure, fluid in the lungs, fainting, and blood clots. 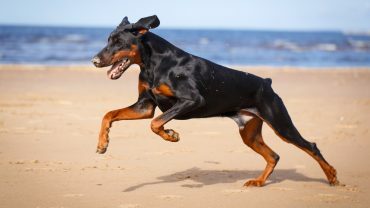 Canine Dilated Cardiomyopathy (DCM) is a progressive primary heart muscle disease that typically affects large breed dogs like Great Danes, Doberman Pinschers, Boxers and Irish Wolfhounds. Canine myxomatous or degenerative mitral valve disease (MMVD) primarily affects older, small to medium size dogs. 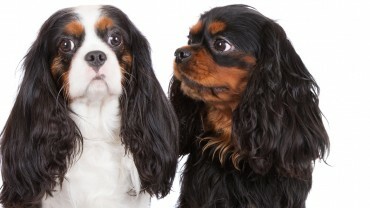 Predisposed breeds include Cavalier King Charles Spaniels and Dachshunds. 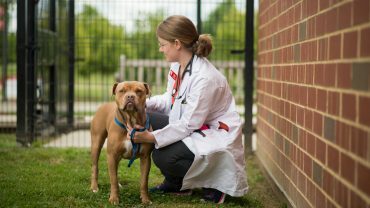 We operate primarily on a referral basis, with the patient’s primary veterinarian referring them to the NC State Cardiology Service by calling us to discuss the patient’s condition. Referral is not required for second opinions, breed-related certifications for congenital heart disease, or treatment of heartworm infection. 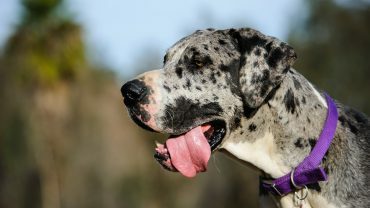 By speaking with the primary veterinarian prior to the appointment, we are often better able to determine the severity of the problem, which of our services the patient is likely to need, how soon the patient needs to be seen, and whether any of the other specialty services at the VH should be consulted. 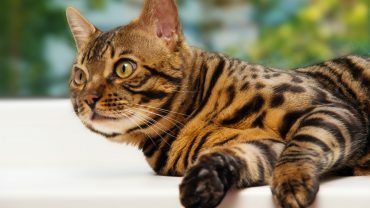 We will also discuss our policies and fees at the time the referral is made, and formulate a plan for communicating our findings to the primary veterinarian. After the referral has been made, clients may call us to make the appointment. We will collect client and patient demographic information, provide an estimate of charges, discuss some of the diagnostic procedures that may be required, and answer any questions the owner may have regarding the visit. To have the best chance of getting a complete diagnostic work-up done in one day, we try to schedule new patients in the morning every day except Wednesday, which is reserved for interventional cardiac catheterization or other semi-elective surgical procedures. Your appointment duration will vary, depending on the nature and complexity of your pet’s condition. If you have scheduling questions or conflicts, please let us know as soon as possible so we can do our best to accommodate your schedule. The initial examination fee is $139, which includes examination by and consultation with a cardiology clinician. The range for the typical outpatient cardiac evaluation ranges from $500 – $1000. Common cardiac diagnostic tests include a blood pressure test, chest radiographs, electrocardiogram, 24-hour ECG monitoring, echocardiogram, and blood and urine testing. Please don’t hesitate to discuss the cost of your pet’s workup if you have concerns or are unclear about the cost of the proposed diagnostic or treatment course. Please note that cost of care estimates greater than $400 require a deposit of the low end of the estimate range. The balance must be paid in full prior to patient discharge. To ensure billing accuracy, each discharged patient’s record is reviewed by an auditor. Charges or credits may be applied to your bill up to 10 business days after the date of discharge. Payment methods: We accept all major credit cards, cash, check or Care Credit. Care Credit: You may apply for Care Credit at 1-800-365-8295 or www.carecredit.com (select NCSU Veterinary Health Complex). If you are using Care Credit, we require the card holder to be present. If this is not possible, please call our reception desk at 919-513-6694 to make arrangements prior to your appointment. We do not accept phone authorization for Care Credit. The veterinary hospital is a not-for-profit health care center and receives less than 2% of operating costs from the State of North Carolina. The majority of our operating costs are paid by client fees and donations. In fact, many of the state-of-the-art diagnostic and treatment options we offer are only possible because of generous gifts from our clients. Our fees are set to cover the balance of our operating costs, and we are always looking for ways to provide better service at lower cost. Total costs are comparable to those of veterinarian specialists in private practice. A brief description of the reason for the appointment with the Cardiology Service, including all of the patient’s symptoms even those that may not seem significant. List of medications patient is receiving, including any over the counter drugs, herbs or metabolic supplements, as well as any problems the patient may be having with the medications. Patient diet history, including treats and snacks. If your pet has a history of being extremely anxious during vet visits, you may want to consult your primary care veterinarian to see if your pet could benefit from an anti-anxiety medication just prior to your appointment. Common anti-anxiety medications, such as oral gabapentin or trazadone, are safe for patients with heart disease. We are unable to prescribe medication over the phone prior to your initial appointment, but are happy to work with your primary care veterinarian to make recommendations. Overview: The NC State Veterinary Hospital is a teaching institution, and your care team includes a board-certified veterinary cardiologist, veterinary nurses (clinical technicians), veterinarians in advanced clinical training programs (residents and interns), fourth-year veterinary students, and at times, international visitors observing the cardiology service. Examination: A clinical technician will settle you and your pet into an exam room, and assess your pet’s vital signs, including blood pressure. 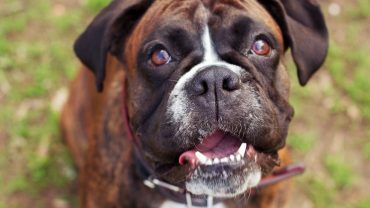 Usually, you will meet a fourth-year veterinary student first, who will review your pet’s medical history and perform an initial cardiovascular physical exam. The student will leave the exam room to briefly review your pet’s case with a cardiology clinician. The cardiology clinician and student will return to the exam room and review your pet’s medical history and perform a second physical exam. The clinician will present and explain their initial assessment and make recommendations for an initial diagnostic plan. Together with the care team, you will decide on the best diagnostic plan for your family. New patients often need to stay with us for a few hours to allow time to complete the necessary diagnostic tests. Diagnostic Tests: For patients with heart disease, tests often include echocardiography, electrocardiography, radiography (x-rays) and blood and urine tests. Chest hair sometimes interferes with imaging studies – if there is a compelling reason not to shave a small patch of your pet’s hair, please let us know before your pet leaves the exam room. Discharge: At discharge, the clinician and student will discuss and explain all of the diagnostic test results. They will also make recommendations for treatment, if needed. The discussion at discharge may take longer than you might anticipate. Please plan on spending at least 15 minutes, and up to an hour, with our team discussing results, treatment, prognosis and making a plan for ongoing care. Once finalized, we will send a detailed written report of diagnostic findings and treatment plans to you and your primary care veterinarian. After your appointment or hospital discharge, we will work with you and your referring primary care veterinarian to provide continued care. Faculty clinicians: Our faculty are licensed veterinarians, ACVIM specialty board-certified cardiologists, who are nationally and internationally recognized experts in cardiology. Technicians: Our veterinary technicians are licensed veterinary nurses, and some are board certified in cardiology (VTS certified). Client Services: Our client services representatives manage patient check-in and discharge, schedule appointments and accept financial payments. Cardiology Residents: Our residents are all licensed veterinarians who have completed at least one year of advanced clinical training. 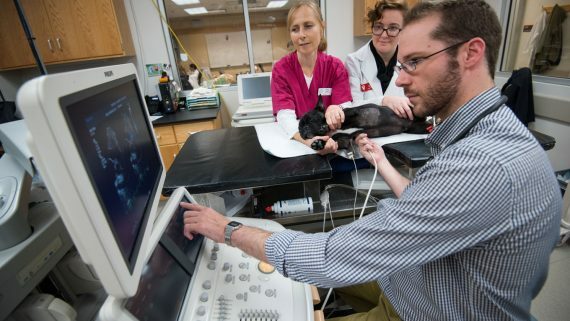 They provide clinical service and teach students as part of an accredited program leading to board certification by the American College of Veterinary Internal Medicine Specialty of Cardiology. Small Animal Interns: Interns are licensed veterinarians in an accredited advanced clinical training program. They also provide clinical service and teaching. Fourth-Year Medical Students: Our fourth-year Doctor of Veterinary Medicine students rotate through hospital services to gain closely supervised clinical experience. Your pet’s health is our top priority. If you feel your pet needs medical attention before your appointment date, the NC State emergency service is available 24/7/365. The phone number for the Small Animal Emergency Service is 919-513-6911. Since we are a specialty service, we are unable to provide routine health care for issues not related to your referral (e.g. vaccination). We serve as an extension of your primary care veterinarian, from whom these services should continue to be obtained. If you would like, please bring a picture of your pet so that we can put it in our photo album of NC State cardiology patients that we keep in our reception areas. The pictures bring lots of enjoyment to our staff and clients. Cancellations: If you need to cancel or reschedule your appointment, please call our Client Services desk at 919-513-6694. Please give us at least 24-hour notice, or you may be charged a missed appointment fee.